Operating a water heater is one of the biggest expenses for many homes on the island. Heating water itself is expensive. Nearly 18% of all domestic energy used today goes to heat water. Typically, we use fossil fuels – gas and oil – to heat the water supply, and these costs are rising. However, as a reaction to the rise in fuel prices comes innovation – people want cheaper residential plumbing services. They’re looking for more efficiency overall. So, in comes solar water heating systems! These are a relatively inexpensive method to heat water for a residential home. It’s a smart investment for a changing world. You’re using free energy! Solar power is free to the public and abundant. Regarding space requirements, solar thermal panels require less space than solar PV panels. The average household would need 2–3 panels to heat water throughout the house. 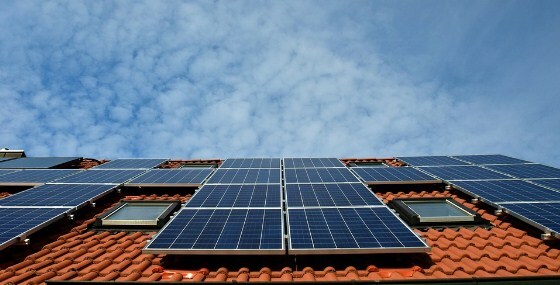 Using PV panels generally means 10–16 panels in total. Efficiency is often a top factor for many homeowners when discussing residential plumbing. Solar water heater systems turn approximately 80% of radiation into heat energy – that’s high efficiency. You’ll save money on fuel bills. An existing water heater system which uses gas could be expensive, so you’ll pay a fraction of that cost each year. Incentives! Residential and commercial properties are entitled to renewable heat incentives. You’ll be paid for generating your own heat energy, regardless of whether you use the entire amount each month or not. There are two primary types of solar water heating systems: passive and active. Batch: An uncomplicated system designed to utilize one or more water tanks inside a solar collector. The water warms inside the tank, and gravity or natural convection moves the water supply to the home’s pipes. Thermosiphon: The tank is separate from the solar collector. Cold water moves directly through the tubes of the solar collector, while natural convection pumps the hot water into a storage tank for safekeeping. Direct: Water will move directly through the solar collectors and into a storage tank using electrical pumps and control systems. Indirect: The solar collectors heat a substance similar to antifreeze called a “heat-transfer fluid.” This fluid then flows into the sealed piping of the heat exchanger where it is surrounded by water. The water acquires heat from the fluid, and is then pumped into the storage tank. Drainback: A drainback system, similar to an indirect system, uses distilled water as its heat-transfer fluid. A separate “drainback” tank is installed for the distilled water. Pumping the heat-transfer fluid out of the system into an interior tank is perfect for any climate except extreme cold – not an issue on Oahu! Schedule top water heater installation in Oahu. Call Emergency Plumbing & Solar at 808-691-9309 today! Advantages of Getting a Solar Water Heater System Overall rating: 5 out of 5 based on 10 reviews.